\discant name generates a discant accordion register symbol. is required near the top of your input file. The register names in the default \discant register set have modeled after numeric Swiss notation like depicted in http://de.wikipedia.org/wiki/Register_%28Akkordeon%29, omitting the slashes and dropping leading zeros. The string name is basically a three-digit number with the lowest digit specifying the number of 16’ reeds, the tens the number of 8’ reeds, and the hundreds specifying the number of 4’ reeds. Without modification, the specified number of reeds in 8’ is centered in the symbol. Newer instruments may have registrations where 8’ can be used either within or without a tone chamber, ‘cassotto’. Notationally, the central dot then indicates use of cassotto. One can suffix the tens’ digits ‘1’ and ‘2’ with ‘+’ or ‘-’ to indicate clustering the dots at the right or left respectively rather than centered. \freeBass name generates a free bass/converter accordion register symbol for the usual two-reed layout. 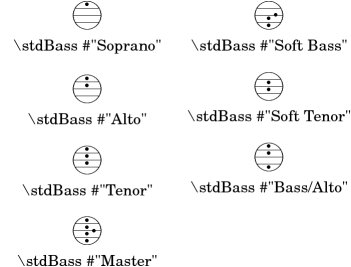 \stdBass name generates a standard bass accordion register symbol. The default bass register definitions have been modeled after the article http://www.accordions.com/index/art/stradella.shtml originally appearing in Accord Magazine. This kind of overlapping arrangement is common for Italian instruments though the exact location of the octave breaks differ. When not composing for a particular target instrument, using the five reed definitions makes more sense than using a four reed layout: in that manner, the ‘Master’ register is unambiguous. This is rather the rule in literature bothering about bass registrations at all. \stdBassIV name generates a standard bass accordion register symbol. Notable instruments are Morino models with MIII (the others are five-reed instead) and the Atlantic IV. Most of those models have three register switches. Some newer Morinos with MIII might have five or even seven. The prevalent three-register layout uses the middle three switches ‘Tenor’, ‘Master’, ‘Soft Bass’. Note that the sound is quite darker than the same registrations of ‘c,’-based instruments. 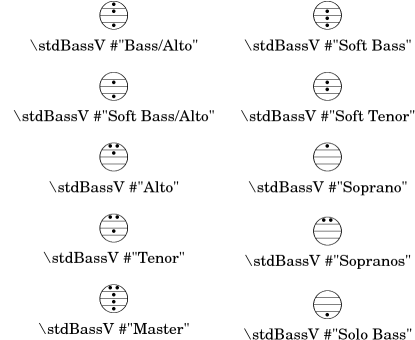 \stdBassV name generates a standard bass accordion register symbol. This tends to be the bass layout for Hohner’s Morino series without convertor or MIII manual. With the exception of the rather new 7-register layout, the highest two chord reeds are usually sounded together. The Older instruments offer 5 or 3 bass registers. The Tango VM offers an additional ‘Solo Bass’ setting that mutes the chord reeds. The symbol on the register buttons of the Tango VM would actually match the physical five-octave layout reflected here, but it is not used in literature. 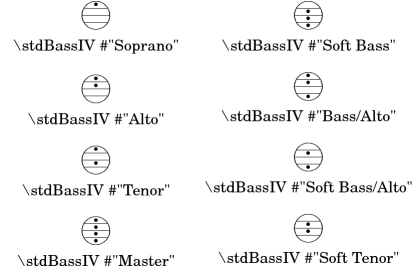 Composers should likely prefer the five-reed versions of these symbols. The mismatch of a four-reed instrument with five-reed symbols is easier to resolve for the player than the other way round. 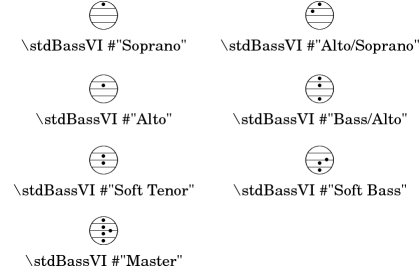 \stdBassVI name generates a standard bass accordion register symbol for six reed basses. The registers are effectively quite similar to that of \stdBass. An additional bass reed at alto pitch is omitted for esthetical reasons from the ‘Master’ setting, so the symbols are almost the same except for the ‘Alto/Soprano’ register with bass notes at Alto pitch and chords at Soprano pitch.